Contractors specializing in FiberTite Roofing, Commercial Roof Repair, Commercial Roof Construction, and all other FiberTite Commercial Roofing Services in CT. Call 1-888-766-3020 for a Free Quote. 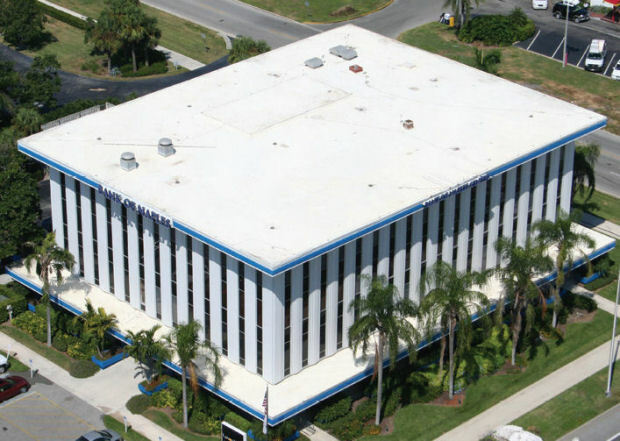 The Seaman Corporation produces single-ply roofing membranes, accessories, components and adhesives used in roofing systems that include FiberTite Roofing Membranes. FiberTite is a unique DuPont™ Elvaloy® Ketone Ethylene Ester (KEE) based roofing system that was invented over a quarter century ago with attributes of superior performance and long-term flexibility. New Roof Connecticut’s licensed and insured roof contractors have years of quality commercial roofing experience in Middlesex, Hartford, New London, Windham, New Haven, Fairfield, Tolland, and Litchfield County. We service all types of buildings and market segments including commercial offices, government buildings, medical offices, hospitals, schools, banks, industrial buildings, residential homes, commercial buildings, housing associations, and apartment buildings. Call New Roof Connecticut 1-888-766-3020 to learn about our FiberTite roofing solutions or request a Free Commercial Roof Quote. 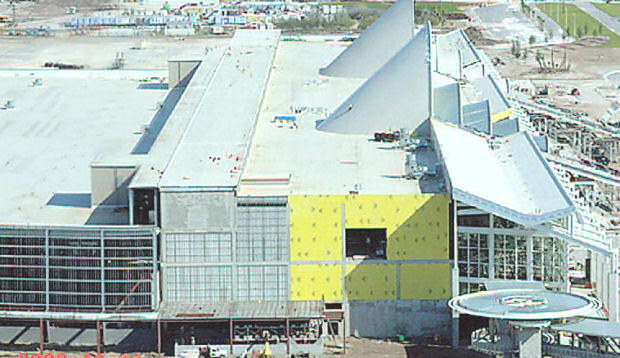 All FiberTite Roofing Membranes are constructed using high tenacity/heavy weight yarns to create a base fabric reinforcement to impart superior puncture, tensile and tear resistance properties. The base polyester fabrics are primed with a unique and proprietary adhesive coat that lays the foundation to physically bond the KEE coatings to the “fiber” to maximize seam strength and overall membrane performance. FiberTite is coated with Seaman Corporation's original "KEE" formulation to provide superior hot air welding characteristics, extreme UV resistance, broad chemical resistance, and long-term flexibility and reparability for the installed roofing membrane system. FiberTite membranes exhibit superior tear, puncture, fungus, algae and flame resistance that make FiberTite Roofing Systems some of the most sustainable roofing systems available. FiberTite has a proven track record of long-life after exposure to the harshest rooftop environments including blistering UV rays, extreme hot and cold temperatures, oils, greases, and caustic chemicals. Stormwater Control: A rooftop garden can retain as much as 70% of rainfall, decreasing the risk of flooding and eliminating sewer and wastewater overflows. Cleaner Air: Rooftop gardens re-oxygenate the air, while removing harmful toxins and pollutants. Reduction in the Urban Heat Island Effect: Unlike dark roofs which attract heat, roof vegetation naturally dissipates heat and helps lower city temperatures. many benefits including enriching the visual landscape and providing tremendous benefits to the environment. Energy Efficiency: Green roofs provide thermal insulation, reducing utility costs. Prolonged Roof Life: Rooftop garden installations extend the life of the waterproofing membrane by preventing temperature fluctuations. Quieter Work Environments: Sound is absorbed by soil and plants creating a natural noise barrier. Additional Outdoor Space: Rooftop gardens make great areas for outdoor recreation and relaxation activities. 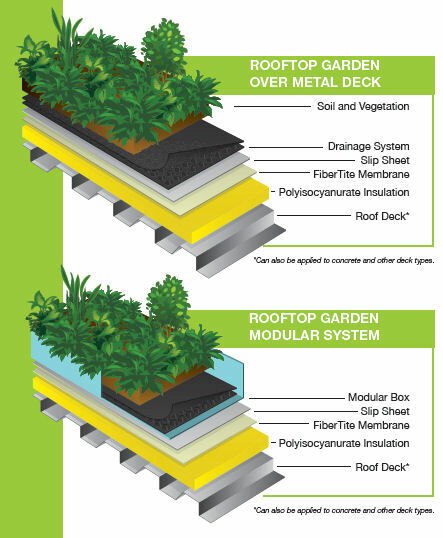 FiberTite Green Roof Systems are available as Extensive Green Roofs and Intensive Green Roofs. Extensive green roofs require less than 6 inches of growth medium and cannot support larger plant life. These roof installations limit access for garden and roof-top equipment maintenance only and are not intended for regular foot traffic. Intensive rooftop gardens are ideal for recreational purposes and incorporate growth medium of 6 or more inches and can support trees, shrubs, gardens and walkways. For more information about FiberTite Roofing Solutions and FiberTite Green Roofs please visit the Official FiberTite Website or contact our Roofing Experts 1-888-766-3020 for more information. Please also feel free to request a Free Commercial Roof Quote.